No, not the fish food. 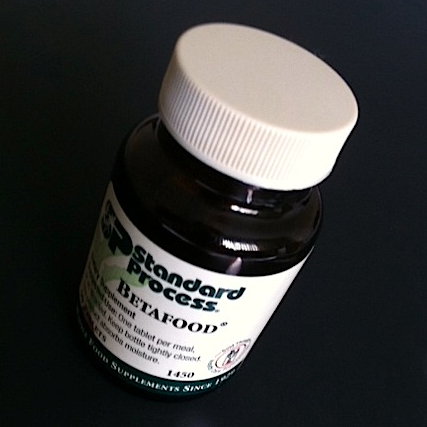 Betafood is a product manufactured by Standard Process. It is nothing more than organic beets. Red beets contain betalain pigments, such as betanin and betacyanin. That is what gives the characteristic red color. Taken daily, betanin will thin the bile that is released from the gallbladder to emulsify fats in the diet. When the food bolus leaves the stomach and enters the small intestine it is slightly acidic (unless you take a proton pump inhibitor like Nexium). The small intestine is slightly alkaline when empty. As the food drops into the small intestine, the pH drops and temporarily becomes acidic. This signals the gallbladder to contract and expel bile. The bile runs along the common bile duct. As it passes the pancreatic duct it triggers the release of pancreatic enzymes that digest the fats, carbohydrates, and proteins. Together, all these digestive chemicals are then dumped into the small intestine. As we age, the bile typically thickens, becoming sluggish and the flow decreases. This is a significant impairment to digestion. The amount of bile released from the gallbladder can also decrease (decreased ejection fraction). This often leads to a gallbladder attack and subsequent surgery to remove the gallbladder. Of course, without adequate HCl to lower the pH of the food bolus, there is no trigger for the gallbladder and subsequently no trigger for the pancreatic enzymes either. This is why proton pump inhibitors create malabsorption syndromes like vitamin B12 deficient anemia and osteoporosis. Clinically, I recommend Betafood daily in my practice. The lowest ejection fraction I have documented is 3% and we raised it to 80% in 3 months by having the patient take one tablet of Betafood with each meal. Betalain has another effect on the body that is even more astounding – it triggers a reflex dilatation of the bile duct through the sense of taste on the tongue. It takes about 15-30 seconds after tasting the betalain for this dilatation to occur. Chewing Betafood can often stop a gallbladder attack in less than a minute. In fact, clinically about 50% of my patients taking Betafood get relief in under a minute just by chewing a tablet. The stuff tastes terrible, but I don’t like beets anyway. I once heard a comedian refer to beets as “dirt jello” and I agree. Dirt jello or canned beets, the Thanksgiving standard contain denatured betalain from the processing so they really don’t help your gallbladder. However, if you take a fresh red beet and bake it in the oven at about 400 degrees for an hour, the betalain remains active. My wife drizzles olive oil and balsamic vinegar over the beets and wraps them in aluminum foil prior to baking. After cooling, she will peel the beets and slice them into bite size wedges, then store them in the refrigerator. Every morning, I eat a slice of beet (think dirt jello) in addition to taking my Betafood. This keeps my bile duct flowing, eliminating any symptoms of GERD, acid reflux, or indigestion. If you suffer any signs of gallbladder inflammation, try some baked beets. If you really want to test your gallbladder, try the Betafood chew test. It works for me.